The wavemaker moon, Daphnis, is featured in this view, taken as NASA's Cassini spacecraft made one of its ring-grazing passes over the outer edges of Saturn's rings on Jan. 16, 2017. This is the closest view of the small moon obtained yet. Daphnis (5 miles or 8 kilometers across) orbits within the 42-kilometer (26-mile) wide Keeler Gap. Cassini's viewing angle causes the gap to appear narrower than it actually is, due to foreshortening. The little moon's gravity raises waves in the edges of the gap in both the horizontal and vertical directions. Cassini was able to observe the vertical structures in 2009, around the time of Saturn's equinox. Like a couple of Saturn's other small ring moons, Atlas and Pan, Daphnis appears to have a narrow ridge around its equator and a fairly smooth mantle of material on its surface—likely an accumulation of fine particles from the rings. A few craters are obvious at this resolution. An additional ridge can be seen further north that runs parallel to the equatorial band. Fine details in the rings are also on display in this image. In particular, a grainy texture is seen in several wide lanes which hints at structures where particles are clumping together. In comparison to the otherwise sharp edges of the Keeler Gap, the wave peak in the gap edge at left has a softened appearance. This is possibly due to the movement of fine ring particles being spread out into the gap following Daphnis' last close approach to that edge on a previous orbit. 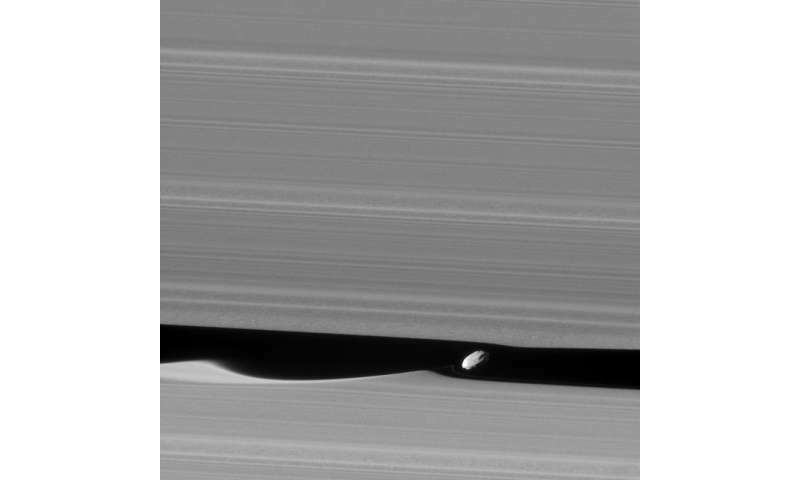 A faint, narrow tendril of ring material follows just behind Daphnis (to its left). This may have resulted from a moment when Daphnis drew a packet of material out of the ring, and now that packet is spreading itself out. The image was taken in visible (green) light with the Cassini spacecraft narrow-angle camera. The view was acquired at a distance of approximately 17,000 miles (28,000 kilometers) from Daphnis and at a Sun-Daphnis-spacecraft, or phase, angle of 71 degrees. Image scale is 551 feet (168 meters) per pixel. Needless to say, that wave is not due to gravity. Needless to say: you're wrong. So if electrismatism is responsible, what then happens to the effects of gravity which we know is real and which we know would have effects on stuff at that distance? Wait - are you saying the earths moon is held in orbit by electricity? Silly me, it must be a wave of dark matter that is causing the wave we can actually see.